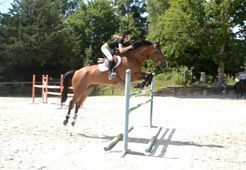 Egor - 2004 Belgium Warmblood (Canadian River x Sundre VD ST Lambertusho), gelding, 178cm. Competeing successfully at the 1.50m Grand Prix level with Hyde Moffatt and 1.40m with a young rider. Qualified young rider to represent Canada in 2016 NAJYR. Excellent dressage, very ridable, honest, careful, and brave. In barn lease only. Royal - 2005, Poney Francais de Selle (Titan du Mougard x Hirondelle d'Orval), 145cm. 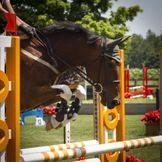 Awesome pony jumper! Fast, careful, brave with a hugely adjustable stride! No issues with the combinations set on horse strides. Experienced at 1.20m. Placed 3rd at the Cedar Run 6-bar, going clean at 1.40m. 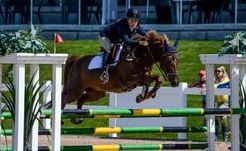 Royal had a clean sweep of three first place finishes to be the 2014 All Canadian Pony Jumper Champion at the Royal Winter Fair in Toronto. Also won the $5000 Pony Jumper Stake at the RAWF 2015.